Temporary art that uses the human body as a canvas. 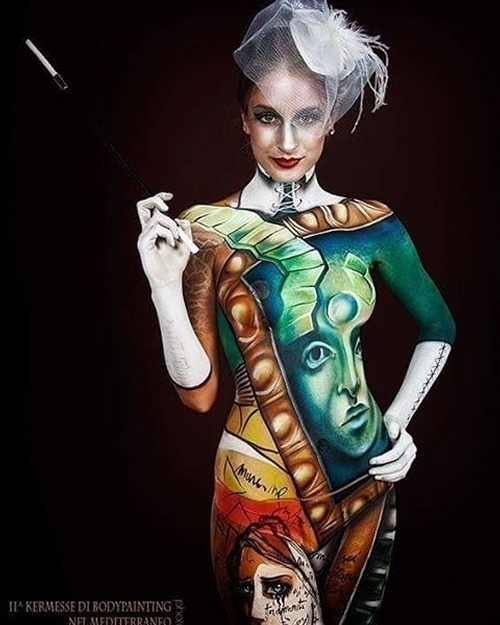 There are many different body painting artists that vary their subject matter, from making people look like monsters, animals, celebrities, to making them disappear in the background. Lucia Postacchini uses the humans as a canvas to paint her art. The body is very uneven and different parts of the it provide a varying skin textures. Trying to draw & paint straight lines and to represent an image on this medium, is not an easy feat. Further more, this painting has to be finished in one sitting, there is no coming back to it, tomorrow. When it is finished and the primary reason for the painting is achieved (art for art's sake or some kind of commercial use), the art is washed off and the only way we know it ever existed, is the photographic record of it. Model Michela Luciani - Photographer Fabrizio Biaggi. In collaboration with Ermanna Seccacini - Model Anna K Acconciatura - Hair Stylist Marina Evangelista - Photographer Davide Da Damos. Giusy Campolongo Assistant Agnese Luciani Photographer Mimmo Di Giuseppe. In collaboration with Ermanna Seccacini - Photographer Enrico Uboldi. Model Michela Luciani - Photographer Andrea Peria. Model Sarà Bonfanti - Photographer Davide Da Damos. In collaboration with Ermanna Seccacini - Model Michela Luciani - Photographer Roberto Fasoli. In collaboration with Ermanna Seccacini - Seccacini Modena Chiara Feliciano - Photographer Tobias Wilcke. In collaboration with Rabarama Ispiration Ermanna Seccacini - Hair Stylist Effige Parrucchieri Marina Evangelista - Photographer Traven Milovich.